Alessi Risotto alla Milanese is the classic risotto dish of Milan. 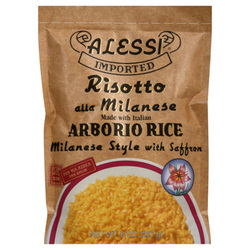 Arborio rice is coupled with saffron, the world's most expensive spice. This robust, intensely flavored dish is the most highly regarded of all risottos and is usually served with meats cooked in a red or wine sauce like Osso Buco.